Objective To determine the risks of stillbirth and neonatal complications by gestational age in uncomplicated monochorionic and dichorionic twin pregnancies. Data sources Medline, Embase, and Cochrane databases (until December 2015). Review methods Databases were searched without language restrictions for studies of women with uncomplicated twin pregnancies that reported rates of stillbirth and neonatal outcomes at various gestational ages. Pregnancies with unclear chorionicity, monoamnionicity, and twin to twin transfusion syndrome were excluded. Meta-analyses of observational studies and cohorts nested within randomised studies were undertaken. Prospective risk of stillbirth was computed for each study at a given week of gestation and compared with the risk of neonatal death among deliveries in the same week. Gestational age specific differences in risk were estimated for stillbirths and neonatal deaths in monochorionic and dichorionic twin pregnancies after 34 weeks’ gestation. Results 32 studies (29 685 dichorionic, 5486 monochorionic pregnancies) were included. In dichorionic twin pregnancies beyond 34 weeks (15 studies, 17 830 pregnancies), the prospective weekly risk of stillbirths from expectant management and the risk of neonatal death from delivery were balanced at 37 weeks’ gestation (risk difference 1.2/1000, 95% confidence interval −1.3 to 3.6; I2=0%). Delay in delivery by a week (to 38 weeks) led to an additional 8.8 perinatal deaths per 1000 pregnancies (95% confidence interval 3.6 to 14.0/1000; I2=0%) compared with the previous week. In monochorionic pregnancies beyond 34 weeks (13 studies, 2149 pregnancies), there was a trend towards an increase in stillbirths compared with neonatal deaths after 36 weeks, with an additional 2.5 per 1000 perinatal deaths, which was not significant (−12.4 to 17.4/1000; I2=0%). The rates of neonatal morbidity showed a consistent reduction with increasing gestational age in monochorionic and dichorionic pregnancies, and admission to the neonatal intensive care unit was the commonest neonatal complication. The actual risk of stillbirth near term might be higher than reported estimates because of the policy of planned delivery in twin pregnancies. Conclusions To minimise perinatal deaths, in uncomplicated dichorionic twin pregnancies delivery should be considered at 37 weeks’ gestation; in monochorionic pregnancies delivery should be considered at 36 weeks. Systematic review registration PROSPERO CRD42014007538. We summarised data from individual studies to quantify the prospective risks of stillbirth in women with uncomplicated monochorionic and dichorionic twin pregnancies, as well as the risks to the newborn, when delivered after 34 weeks’ gestation and at various gestational ages. Two independent reviewers (FC-S and ES) used a two stage process to select the studies. In the first stage, they assessed abstracts and titles of citations for their eligibility. In the second stage, we obtained the full texts of the studies that seemed to fulfil the inclusion criteria for evaluation. We included observational cohort studies and cohorts nested in randomised studies on rates of stillbirth or neonatal outcomes in monochorionic and/or dichorionic twin pregnancies. Exclusion criteria were unclear chorionicity, monoamnionicity, inability to exclude twin to twin transfusion syndrome in fetuses, and outcomes not provided in weekly or two weekly gestational periods. We defined stillbirth as a baby born without signs of life after the age of viability or any other definition used by the authors. Neonatal mortality was defined as death up to 28 days after delivery. For infants born after 34 completed weeks of gestation, we considered the following morbidity outcomes to be clinically relevant: need for assisted ventilation, respiratory distress syndrome, septicaemia, hypoxic ischaemic encephalopathy or neonatal seizures, and admission to the neonatal intensive care unit. For preterm infants born between 26 and 33+6 weeks’ gestation, in addition to the above, we assessed the rates of bronchopulmonary dysplasia, necrotising enterocolitis, significantly abnormal results on cranial ultrasound scan (cystic periventricular leukomalacia or grade 3 or 4 intraventricular haemorrhage), and retinopathy of prematurity (stages 3 to 5) (appendix 2). Two independent reviewers (FCS and ES) evaluated the quality of the studies by investigating separate parameters for the internal validity (the extent to which the information is probably free from bias) and external validity (the representativeness of the population).22 23 24 We evaluated individual parameters such as study design, method of sampling, adequacy of follow-up, ascertainment of the outcome, and appropriate determination of gestational age and chorionicity for internal validity. Studies with features such as prospective design, consecutive or random recruitment of patients, follow-up rates of over 80%, and use of signs on first trimester ultrasonography to determine chorionicity and gestational age were considered to have a low risk of bias. Studies without these features or with unclear reporting were classified to have high risk of bias. We categorised the studies with the following criteria to be highly representative for external validity: clear definition of uncomplicated twin pregnancies, exclusion of pregnancies in which one or both babies were diagnosed antenatally with growth restriction, or major congenital abnormalities. Any discrepancies were resolved after discussion with a third reviewer (ST). We undertook separate analyses for risks of stillbirth and neonatal complications in monochorionic and dichorionic twin pregnancies in two periods: from 34 weeks’ gestation and beyond and early preterm (<34 weeks’) gestation. From 34 weeks onwards, we estimated the risks by weekly gestational ages, with the 34 week period representing pregnancies entering the 34+0 to 34+6 weeks’ gestation with live fetuses, and so forth. For early preterm (<34 weeks’) gestation, we estimated risks of outcomes by two weekly intervals. We computed the weekly prospective risk of stillbirth by dividing the number of stillbirths observed at that week by the number of women at risk in the same week. For a given gestational age, we defined women at risk of stillbirth as those who were still pregnant at the beginning of the week. We corrected for deliveries in that week by subtracting half the number of women who delivered that week.25 For risk of neonatal death, we used a similar approach and divided the number of neonatal deaths observed by the number of deliveries that week. 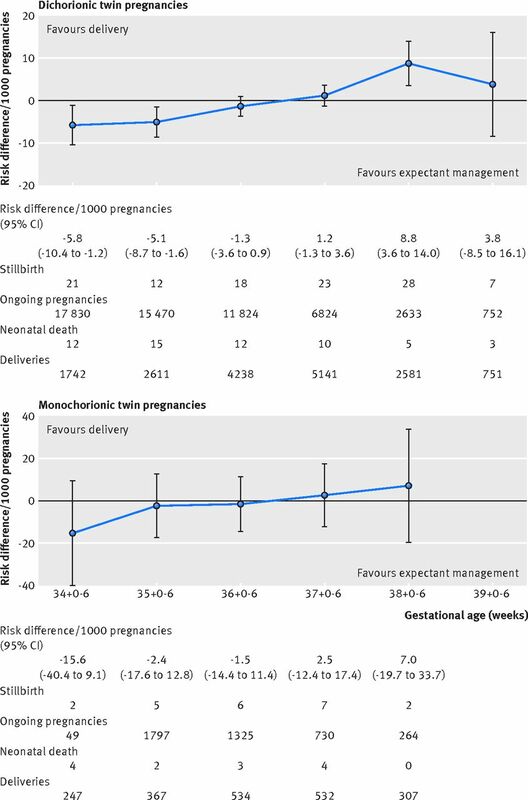 In pregnancies beyond 34 weeks’ gestation, we assessed the competing risks of expectant management versus delivery at a particular gestational age for each study. We defined the risk of perinatal death at a given gestational week as the difference between risk of stillbirth and risk of neonatal death for deliveries in that week. This provided a direct measure of benefit or harm from expectant management versus immediate delivery strategy. A difference of less than zero indicates a reduction in the risk of perinatal death with expectant management at that gestational age compared with immediate delivery. We pooled risk differences from individual studies using a fixed effect model weighted by the inverse of its variance. We computed I2 as an estimation of heterogeneity between studies and assumed values lower than 50% as little heterogeneity and I2 greater than 75% as substantial heterogeneity. We estimated the weekly risk of neonatal outcomes by fitting multilevel random effects logistic regression models with gestational age as the unique categorical independent variable. The units of the analysis were pregnancies (first level) that were clustered within studies (second level of the analysis). We obtained point estimates of the risk of each event by the gestational period with its corresponding 95% confidence interval. Before analysis we planned to restrict our evaluation up to the gestational week for which robust unbiased data were available. Sensitivity analysis was planned before analysis to exclude studies involving pregnancies complicated by congenital abnormalities and those with low external validity. We assessed publication bias and small study effect using funnel plots representing overall event rate (logit scale) versus the inverse of sample size for each study included in main analysis.26 Peter’s test was used to evaluate funnel asymmetry by fitting a weighted linear regression with the logit of event rate as dependent variable and the inverse of sample size as independent variable. We computed weights according to the number of events and no events.27 We used a continuity correction for studies with no events by adding 0.5 to the events count and 1 to the total sample size. Fifteen studies on dichorionic pregnancies (17 830 women) and 13 on monochorionic pregnancies (2149 women) provided weekly stillbirth data after 34 weeks’ gestation. The corresponding neonatal death rates were provided by 13 (n=10 333) studies for dichorionic and 11 (n=1461) for monochorionic pregnancies. Overall, 14 studies excluded pregnancies complicated by fetal growth restriction, and 28 studies excluded pregnancies with major congenital abnormalities. The diagnoses of fetal growth restriction and congenital abnormalities were made antenatally. Two studies reviewed the postmortem findings of stillborn babies for evidence of growth restriction. There were no major differences between the studies in the definitions of stillbirths, neonatal mortality, and morbidity outcomes (appendix 2). The number of stillbirths and neonatal deaths between 26 and 33+6 weeks and after 34 weeks’ gestation in individual studies for monochorionic and dichorionic pregnancies are provided in appendix 3. The quality of the studies was adequately representative in 27 (27/32, 84%) and inadequately or unclearly representative in five (5/32, 16%) (fig 2⇓). Fifteen of the included studies (15/32) were prospective, and, of these, 12 (12/32, 38%) were nested cohorts in randomised trials. Most studies used random or consecutive sampling methods (31/32, 97%), achieved adequate follow-up (26/32, 81%), and had low ascertainment bias in determining stillbirth outcome (31/32, 97%). 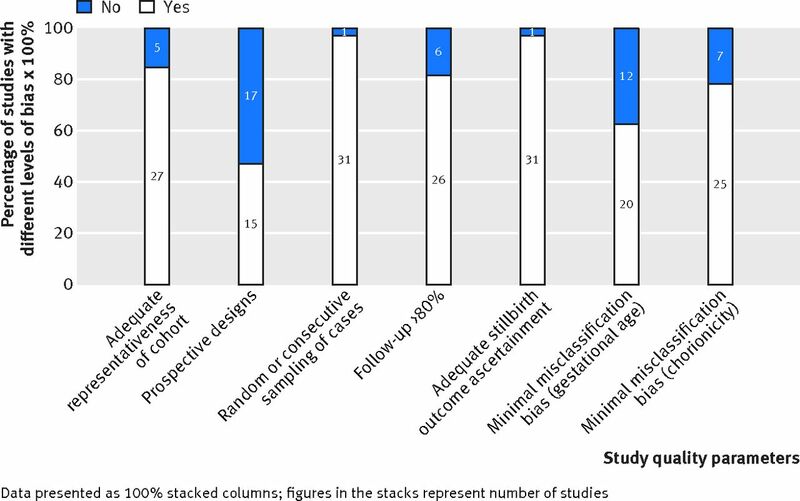 Twenty studies had a low risk of misclassification bias for assessment of gestational age (20/32, 63%) and determination of chorionicity (25/32, 78%). The prospective risk of stillbirth was 1.2 per 1000 pregnancies (95% confidence interval 0.7 to 1.8) at 34+0-6 weeks, with the corresponding risk of neonatal death of 6.7 per 1000 pregnancies (3.3 to 13.5) (table 1⇓). The risk of stillbirth was significantly lower than the risk of neonatal death at 34+0-6 weeks (risk difference −5.8/1000, −10.4 to −1.2/1000; I2=0%) and 35+0-6 weeks (−5.1/1000, −8.7 to −1.6/1000; I2=0%). The perinatal risks were balanced at 37+0-6 weeks (1.2/1000, −1.3 to 3.6/1000; I2=0%), beyond which the risks of stillbirth (10.6, 7.1 to 15.3) significantly outweighed the risk of neonatal death (1.5/1000, 0.7 to 3.3) from delivery (risk difference 8.8/1000, 3.6 to 14/1000; I2=0%) (fig 3⇓). Analysis in which we excluded fetuses with congenital abnormalities showed results similar to the main analysis (appendix 4). Exclusion of studies with low external validity showed a trend towards an increased risk of stillbirth rather than an increased risk of neonatal death beyond 37+0-6 weeks, which was not significant. At 34 weeks, the prospective risk of stillbirth and neonatal mortality rates in monochorionic pregnancies were 0.9 (95% confidence interval 0.1 to 3.4) and 12.1 (4.2 to 34.3), respectively. The risks of neonatal death were higher than the risks of stillbirth at 34+0-6 (risk difference −15.6/1000, 95% confidence interval −40.4 to 9.1/1000; I2=0%) and 35+0-6 weeks (−2.4/1000, −17.6 to 12.8/1000; I2=0%), which were not significant (fig 3⇑). Beyond 36+0-6 weeks, we observed a trend where the risk of stillbirth (9.6/1000, 3.9 to 19.7) was higher than the risk of neonatal death (3.6/1000, 1.2 to 11.1) with a risk difference of 2.5/1000 (−12.4 to 17.4/1000; I2=0%). Sensitivity analysis in which we excluded studies with congenitally malformed fetuses (appendix 4) and studies with low external validity showed similar findings. All analyses were restricted up to 38 weeks for monochorionic twin pregnancies and up to 39 weeks for dichorionic twin pregnancies because of the lack of availability of robust data beyond this period. We observed a consistent and significant reduction in the rates of assisted ventilation, respiratory distress syndrome, admission to neonatal intensive care unit, and septicaemia with increasing gestational age in babies of both monochorionic and dichorionic twin pregnancies (table 2⇓). Admission to neonatal intensive care was the commonest complication in monochorionic and dichorionic twin pregnancies. The cumulative risks of stillbirth and risks of neonatal deaths by two weekly gestational periods in early preterm twin pregnancies (gestation 26+0 to 33+6) are provided in appendix 5. Early preterm neonatal outcomes in two weekly time periods are shown in appendix 6. Neonatal morbidity reduced with increasing gestational age in all twin pregnancies. In both monochorionic and dichorionic pregnancies, the most common neonatal complications were respiratory distress syndrome, septicaemia, admission to neonatal intensive care unit and need for assisted ventilation. Funnel plots showed a slight asymmetry for stillbirth outcome in dichorionic pregnancies (Peter’s test P=0.037), consistent with the finding that smaller studies are published if they show higher rates of stillbirth. We found no more significant asymmetries for outcome of neonatal death. In dichorionic twin pregnancies the perinatal risks are balanced until 37+0-6 weeks’ gestation, and until 36+0-6 in monochorionic pregnancies, with higher risks of stillbirths than neonatal deaths beyond this gestation. Our study provides comprehensive estimates comparing risks of stillbirth and neonatal mortality at various gestational ages, which is required for the planning of delivery in uncomplicated twin pregnancies. This was the largest and most robust systematic review to date on stillbirths and neonatal outcomes in twin pregnancies. In addition to the risk of stillbirth at each gestational week, we provided risk estimates of the other equally important consequence of early delivery—namely, neonatal death. Ours is the first review to provide estimates of neonatal morbidity for specific chorionicity and gestational age in twin pregnancies. All the included studies were relatively recent and published within the past 10 years. The sharing of unpublished aggregate and individual patient data by authors enabled us to provide our findings in clinically relevant weekly intervals. We chose the gestational timeframes to reduce bias from varied lengths of follow-up. We minimised heterogeneity by excluding studies without clear details on twin-to-twin transfusion syndrome. Our sensitivity analyses allowed us to assess the risks in pregnancies not complicated by congenital malformation and by fetal growth restriction. Our findings were limited by the policy of planned delivery beyond 37 and 38 weeks’ gestation in most studies. This reduced the available sample size near term, particularly in monochorionic pregnancies, and could have led to underestimation of risk of stillbirth in the last weeks of pregnancy. Although the observed increased risk of stillbirth was higher than the increased risk of neonatal death beyond 36 weeks in monochorionic pregnancies, the differences were not significant. This was because of the gradual decline in the number of pregnancies available for analysis, which could be attributed to the policy of elective delivery near term. Most studies did not provide details on whether stillbirth was diagnosed antenatally or at birth. Given the policy of regular ultrasound for fetal monitoring in most units, however, we expect the interval between diagnosis and delivery to be small. The variation observed in the clinical management of twin pregnancies and neonatal care after delivery between centres could also have influenced the outcomes.59 The small study effects that we observed for stillbirth outcomes in monochorionic pregnancies could be attributed to selective reporting or publication of data from centres showing good outcomes and small sample sizes. We ensured that all data were available from 34 weeks for women in randomised trials, but it is possible that women with early stillbirth would not be in the analysis. We undertook a pragmatic approach by including all twin pregnancies not complicated by twin to twin transfusion syndrome. We were not able to provide separate estimates for individual causes of neonatal mortality or for elective and emergency deliveries. The results did not vary after we excluded pregnancies complicated by fetal growth restriction, one of the main indications for emergency delivery. We focused only on short term neonatal morbidity because of paucity of data.60 61 We provided the risk estimates per pregnancy and not per fetus, as it is likely that mothers would consider the prospective risk of death in either of their fetuses in utero or after delivery to be equally important. This, however, limited our ability to distinguish between those pregnancies with a single or double adverse outcome. Some current recommendations offer expectant management of uncomplicated dichorionic twin pregnancies until 38+0-6.8 10 Based on our findings, this poses a risk of an additional 8.8 perinatal deaths compared with delivery a week earlier. Although we observed a change in the direction of the difference in risk, with more stillbirths than neonatal deaths beyond 36 weeks in monochorionic twin pregnancies, the difference was not significant. The variation in policies for management of monochorionic twin pregnancies, with some advocating delivery as early as 34+0-6 weeks,8 10 have contributed to the fall in number of pregnancies available for analysis in later gestation. Based on our findings, there is no clear evidence to recommend early preterm delivery routinely before 36 weeks in monochorionic pregnancies. The information on risks provided in twin pregnancies will complement the ongoing national and international efforts to reduce the rates of stillbirths70 and unexpected neonatal complications in babies born near term. For women with dichorionic pregnancies, delivery should be considered at 37 weeks’ gestation to minimise the risk of perinatal deaths near term. There is insufficient evidence to recommend routine delivery before 36 weeks’ gestation in monochorionic twins. Our estimates of fetal and neonatal outcomes at various gestational ages in twin pregnancies should be taken into account when decisions are made on timing of delivery. We thank Stephen Wood who contributed to the acquisition of data for the work, revisions of the draft, and analysis (as a peer reviewer). Contributors: BT and STh are joint lead authors. Substantial contribution to conception and design, acquisition, analysis, and interpretation of data for work (BT); substantial contribution to conception and design, acquisition, analysis, and interpretation of data for work and developed the review protocol (STh); substantial contribution to acquisition, analysis, interpretation of data for work (FC-S, ES, JB, KSJ, EA); substantial contribution to analysis and interpretation of data for work (DA-M, JZ); substantial contribution to acquisition of data for work (AK, KH, LL, AL, SL, JEN, JM, CAC, TJG, KM, VS, AP, LR, KW, AN, MA, DR, ET, FB, FMR, JNR, JMD, RBN, SB, STa, BWJM); performing all statistical analyses (DA-M, JZ); writing of initial drafts and revisions (FC-S); contribution to initial and critical revisions of drafts (JZ); and writing of critical revision of drafts (ES, DA-M, AK, JB, KSJ, EA, KH, LL, AL, SL, JEN, JM, CAC, TJG, KM, VS, AP, LR, KW, AN, MA, DR, ET, FB, FMR, JNR, JMD, RBN, SB, STa, BWJM, BT, STh). All authors approved the final version and agree to be accountable for all aspects of work. Peter C, Wenzlaff P, Kruempelmann J, Alzen G, Bueltmann E. Perinatal morbidity and early neonatal mortality in twin pregnancies. Open J Obstet Gynecol2013;3:78-89doi:10.4236/ojog.2013.31017. Ortibus E, Lopriore E, Deprest J, et al. The pregnancy and long-term neurodevelopmental outcome of monochorionic diamniotic twin gestations: a multicenter prospective cohort study from the first trimester onward. Am J Obstet Gynecol2009;200:494.e1-8. doi:10.1016/j.ajog.2009.01.048 pmid:19375567. Russo FM, Pozzi E, Pelizzoni F, et al. Stillbirths in singletons, dichorionic and monochorionic twins: a comparison of risks and causes. Eur J Obstet Gynecol Reprod Biol2013;170:131-6. doi:10.1016/j.ejogrb.2013.06.014 pmid:23830966. Poulter D. Multiple Births. Parliamentary business 2014; Information on the number of obstetrics claims received between 1 April 2004 and 2031 March 2014 which have involved a multiple pregnancy are set out in the following tables. http://www.parliament.uk/business/publications/written-questions-answers-statements/written-question/Commons/2014-12-05/217336/, 2016. Royal Australain and New Zealand Colleges of Obstetricians and Gynaecologists. Management of monochorionic twin pregnancy. C-Obs 42.RANZCOG, 2014: 1-11. Flenady V, Wojcieszek AM, Middleton P, et al. Lancet Ending Preventable Stillbirths study group Lancet Stillbirths In High-Income Countries Investigator Group. Stillbirths: recall to action in high-income countries. Lancet2016;387:691-702. doi:10.1016/S0140-6736(15)01020-X pmid:26794070. Heazell AE, Whitworth MK, Whitcombe J, et al. Research priorities for stillbirth: process overview and results from UK Stillbirth Priority Setting Partnership. Ultrasound Obstet Gynecol2015;46:641-7. doi:10.1002/uog.15738 pmid:26336941. American College of Obstetricians and Gynecologists Society for Maternal-Fetal Medicine. ACOG Practice Bulletin No. 144: Multifetal gestations: twin, triplet, and higher-order multifetal pregnancies. Obstet Gynecol2014;123:1118-32. doi:10.1097/01.AOG.0000446856.51061.3e pmid:24785876. NICE. Multiple pregnancy. The management of twin and triplet pregnancies in the antenatal period. NICE clinical guideline 129.National Institute for Health and Clinical Excellence, 2011. Spong CY, Mercer BM, D’alton M, Kilpatrick S, Blackwell S, Saade G. Timing of indicated late-preterm and early-term birth. Obstet Gynecol2011;118:323-33. doi:10.1097/AOG.0b013e3182255999 pmid:21775849. Cleary-Goldman J, D’Alton ME. Prospective risk of intrauterine death of monochorionic-diamniotic twins. Am J Obstet Gynecol2007;196:e11-2, author reply e11-2. doi:10.1016/j.ajog.2006.09.047 pmid:17346501. Vayssière C, Benoist G, Blondel B, et al. French College of Gynaecologists and Obstetricians. Twin pregnancies: guidelines for clinical practice from the French College of Gynaecologists and Obstetricians (CNGOF). Eur J Obstet Gynecol Reprod Biol2011;156:12-7. doi:10.1016/j.ejogrb.2010.12.045 pmid:21277672. Danon D, Sekar R, Hack KE, Fisk NM. Increased stillbirth in uncomplicated monochorionic twin pregnancies: a systematic review and meta-analysis. Obstet Gynecol2013;121:1318-26. doi:10.1097/AOG.0b013e318292766b pmid:23812469. Draper ES, Manktelow B, Field DJ, James D. Prediction of survival for preterm births by weight and gestational age: retrospective population based study. BMJ1999;319:1093-7. doi:10.1136/bmj.319.7217.1093 pmid:10531097. Suzuki S, Otsubo Y, Sawa R, Yoneyama Y, Araki T. Clinical trial of induction of labor versus expectant management in twin pregnancy. Gynecol Obstet Invest2000;49:24-7. doi:10.1159/000010207 pmid:10629368. Dodd JM, Crowther CA, Haslam RR, Robinson JS. Twins Timing of Birth Trial Group. 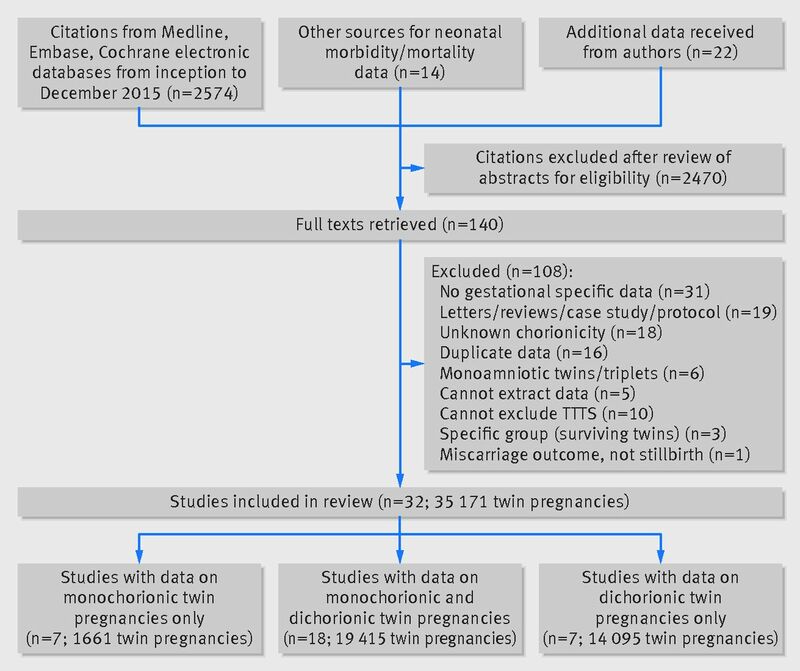 Elective birth at 37 weeks of gestation versus standard care for women with an uncomplicated twin pregnancy at term: the Twins Timing of Birth Randomised Trial. BJOG2012;119:964-73. doi:10.1111/j.1471-0528.2012.03356.x pmid:22691051. Cheong-See F, Schuit E, Arroyo-Manzano D, et al. Optimal timing of delivery in women with twin pregnancies: A meta-analysis of evidence. PROSPERO: International prospective register of systematic reviews. CRD42014007538. Mol BW, Ruifrok AE. Global Obstetrics Network. Global alignment, coordination and collaboration in perinatal research: the Global Obstetrics Network (GONet) Initiative. Am J Perinatol2013;30:163-6.pmid:22893554. Schuit E, Stock S, Groenwold RH, et al. Progestogens to prevent preterm birth in twin pregnancies: an individual participant data meta-analysis of randomized trials. BMC Pregnancy Childbirth2012;12:13. doi:10.1186/1471-2393-12-13 pmid:22420582. Glasziou P, Irwig L, Bain C, Colditz G. Systematic reviews in health care. A practical guide.2nd ed. Cambridge University Press, 2004: 67-73. Latthe P, Latthe M, Say L, Gülmezoglu M, Khan KS. WHO systematic review of prevalence of chronic pelvic pain: a neglected reproductive health morbidity. BMC Public Health2006;6:177. doi:10.1186/1471-2458-6-177 pmid:16824213. Khan KS, Wojdyla D, Say L, Gülmezoglu AM, Van Look PFA. WHO analysis of causes of maternal death: a systematic review. Lancet2006;367:1066-74. doi:10.1016/S0140-6736(06)68397-9 pmid:16581405. Kramer MS, Liu S, Luo Z, Yuan H, Platt RW, Joseph KS. Fetal and Infant Health Study Group of the Canadian Perinatal Surveillance System. Analysis of perinatal mortality and its components: time for a change?Am J Epidemiol2002;156:493-7. doi:10.1093/aje/kwf077 pmid:12225996. Hunter JP, Saratzis A, Sutton AJ, Boucher RH, Sayers RD, Bown MJ. In meta-analyses of proportion studies, funnel plots were found to be an inaccurate method of assessing publication bias. J Clin Epidemiol2014;67:897-903. doi:10.1016/j.jclinepi.2014.03.003 pmid:24794697. Moreno SG, Sutton AJ, Ades AE, et al. Assessment of regression-based methods to adjust for publication bias through a comprehensive simulation study. BMC Med Res Methodol2009;9:2. doi:10.1186/1471-2288-9-2 pmid:19138428. Aboulghar MM, Aboulghar MA, Amin YM, Al-Inany HG, Mansour RT, Serour GI. The use of vaginal natural progesterone for prevention of preterm birth in IVF/ICSI pregnancies. Reprod Biomed Online2012;25:133-8. doi:10.1016/j.rbmo.2012.03.013 pmid:22695310. Barigye O, Pasquini L, Galea P, Chambers H, Chappell L, Fisk NM. High risk of unexpected late fetal death in monochorionic twins despite intensive ultrasound surveillance: a cohort study. PLoS Med2005;2:e172. doi:10.1371/journal.pmed.0020172 pmid:15971947. Barrett JF, Hannah ME, Hutton EK, et al. Twin Birth Study Collaborative Group. A randomized trial of planned cesarean or vaginal delivery for twin pregnancy. N Engl J Med2013;369:1295-305. doi:10.1056/NEJMoa1214939 pmid:24088091. Berezowsky A, Yinon Y, Mazaki-Tovi S, et al. Neonatal outcome at late prematurity of uncomplicated monochorionic twins: what is the optimal time for delivery?Am J Obstet Gynecol2014;210:S101doi:10.1016/j.ajog.2013.10.213. Breathnach FMMF, McAuliffe FM, Geary M, et al. Perinatal Ireland Research Consortium. Optimum timing for planned delivery of uncomplicated monochorionic and dichorionic twin pregnancies. Obstet Gynecol2012;119:50-9. doi:10.1097/AOG.0b013e31823d7b06 pmid:22183211. Briery CM, Veillon EW, Klauser CK, et al. Progesterone does not prevent preterm births in women with twins. South Med J2009;102:900-4. doi:10.1097/SMJ.0b013e3181afee12 pmid:19668021. Burgess JL, Unal ER, Nietert PJ, Newman RB. Risk of late-preterm stillbirth and neonatal morbidity for monochorionic and dichorionic twins. Am J Obstet Gynecol2014;210:578.e1-9. doi:10.1016/j.ajog.2014.03.003 pmid:24607757. Combs CA, Garite T, Maurel K, Das A, Porto M. Obstetrix Collaborative Research Network. 17-hydroxyprogesterone caproate for twin pregnancy: a double-blind, randomized clinical trial. Am J Obstet Gynecol2011;204:221.e1-8. doi:10.1016/j.ajog.2010.12.042 pmid:21376161. Domingues AP, Fonseca E, Vasco E, Moura P. Should apparently uncomplicated monochorionic twins be delivered electively at 32 weeks?J Matern Fetal Neonatal Med2009;22:1077-80. doi:10.3109/14767050903042579 pmid:19900048. Farah N, Hogan J, Johnson S, Stuart B, Daly S. Prospective risk of fetal death in uncomplicated monochorionic twins. Acta Obstet Gynecol Scand2012;91:382-5. doi:10.1111/j.1600-0412.2011.01288.x pmid:21950601. Hack KE, Derks JB, Elias SG, et al. Increased perinatal mortality and morbidity in monochorionic versus dichorionic twin pregnancies: clinical implications of a large Dutch cohort study. BJOG2008;115:58-67. doi:10.1111/j.1471-0528.2007.01556.x pmid:17999692. Hack KE, Derks JB, Elias SG, et al. Perinatal mortality and mode of delivery in monochorionic diamniotic twin pregnancies ≥ 32 weeks of gestation: a multicentre retrospective cohort study. BJOG2011;118:1090-7. doi:10.1111/j.1471-0528.2011.02955.x pmid:21585638. Lee YM, Wylie BJ, Simpson LL, D’Alton ME. Twin chorionicity and the risk of stillbirth. Obstet Gynecol2008;111:301-8. doi:10.1097/AOG.0b013e318160d65d pmid:18238966. Lewi L, Jani J, Blickstein I, et al. The outcome of monochorionic diamniotic twin gestations in the era of invasive fetal therapy: a prospective cohort study. Am J Obstet Gynecol2008;199:514.e1-8. doi:10.1016/j.ajog.2008.03.050 pmid:18533114. Liem S, Schuit E, Hegeman M, et al. Cervical pessaries for prevention of preterm birth in women with a multiple pregnancy (ProTWIN): a multicentre, open-label randomised controlled trial. Lancet2013;382:1341-9. doi:10.1016/S0140-6736(13)61408-7 pmid:23924878. Lim AC, Schuit E, Bloemenkamp K, et al. 17α-hydroxyprogesterone caproate for the prevention of adverse neonatal outcome in multiple pregnancies: a randomized controlled trial. Obstet Gynecol2011;118:513-20. doi:10.1097/AOG.0b013e31822ad6aa pmid:21860279. Mahony R, Mulcahy C, McAuliffe F, Herlihy CO, Carroll S, Foley ME. Fetal death in twins. Acta Obstet Gynecol Scand2011;90:1274-80. doi:10.1111/j.1600-0412.2011.01239.x pmid:21762113. McPherson JA, Odibo AO, Shanks AL, Roehl KA, Macones GA, Cahill AG. Impact of chorionicity on risk and timing of intrauterine fetal demise in twin pregnancies. Am J Obstet Gynecol2012;207:190.e1-6. doi:10.1016/j.ajog.2012.07.031 pmid:22939722. Morikawa M, Yamada T, Yamada T, Sato S, Cho K, Minakami H. Prospective risk of stillbirth: monochorionic diamniotic twins vs. dichorionic twins. J Perinat Med2012;40:245-9. doi:10.1515/jpm-2011-0205 pmid:22505501. Nakayama S, Ishii K, Kawaguchi H, et al. Perinatal outcome of monochorionic diamniotic twin pregnancies managed from early gestation at a single center. J Obstet Gynaecol Res2012;38:692-7. doi:10.1111/j.1447-0756.2011.01759.x pmid:22413750. Norman JE, Mackenzie F, Owen P, et al. Progesterone for the prevention of preterm birth in twin pregnancy (STOPPIT): a randomised, double-blind, placebo-controlled study and meta-analysis. Lancet2009;373:2034-40. doi:10.1016/S0140-6736(09)60947-8 pmid:19523680. Rode L, Klein K, Nicolaides KH, Krampl-Bettelheim E, Tabor A. PREDICT Group. Prevention of preterm delivery in twin gestations (PREDICT): a multicenter, randomized, placebo-controlled trial on the effect of vaginal micronized progesterone. Ultrasound Obstet Gynecol2011;38:272-80. doi:10.1002/uog.9093 pmid:21739497. Rouse DJ, Caritis SN, Peaceman AM, et al. National Institute of Child Health and Human Development Maternal-Fetal Medicine Units Network. A trial of 17 alpha-hydroxyprogesterone caproate to prevent prematurity in twins. N Engl J Med2007;357:454-61. doi:10.1056/NEJMoa070641 pmid:17671253. Serra V, Perales A, Meseguer J, et al. Increased doses of vaginal progesterone for the prevention of preterm birth in twin pregnancies: a randomised controlled double-blind multicentre trial. BJOG2013;120:50-7. doi:10.1111/j.1471-0528.2012.03448.x pmid:22882759. Smith NA, Wilkins-Haug L, Santolaya-Forgas J, et al. Contemporary management of monochorionic diamniotic twins: outcomes and delivery recommendations revisited. Am J Obstet Gynecol2010;203:133.e1-6. doi:10.1016/j.ajog.2010.02.066 pmid:20579959. Southwest Thames Obstetric Research Collaborative (STORK). Prospective risk of late stillbirth in monochorionic twins: a regional cohort study. Ultrasound Obstet Gynecol2012;39:500-4. doi:10.1002/uog.11110 pmid:22302586. Suzuki S, Inde Y, Miyake H. Comparison of short-term outcomes of late pre-term singletons and dichorionic twins and optimal timing of delivery. J Obstet Gynaecol2010;30:574-7. doi:10.3109/01443615.2010.494207 pmid:20701505. Awwad J, Usta I, Ghazeeri G, et al. A randomised controlled double-blind clinical trial of 17-hydroxyprogesterone caproate for the prevention of preterm birth in twin gestation (PROGESTWIN): evidence for reduced neonatal morbidity. BJOG2015;122:71-9. doi:10.1111/1471-0528.13031 pmid:25163819. Bhattacharya S, Black S. Unpublished data from Aberdeen Maternity and Neonatal Databank, 2015. Wood S, Tang S, Ross S, Sauve R. Stillbirth in twins, exploring the optimal gestational age for delivery: a retrospective cohort study. BJOG2014;121:1284-90, discussion 1291. doi:10.1111/1471-0528.12866 pmid:24888505. Braunholtz DA, Edwards SJ, Lilford RJ. Are randomized clinical trials good for us (in the short term)? Evidence for a “trial effect”. J Clin Epidemiol2001;54:217-24. doi:10.1016/S0895-4356(00)00305-X pmid:11223318. Lorenz JM. Neurodevelopmental outcomes of twins. Semin Perinatol2012;36:201-12. doi:10.1053/j.semperi.2012.02.005 pmid:22713502. Woythaler MA, McCormick MC, Smith VC. Late preterm infants have worse 24-month neurodevelopmental outcomes than term infants. Pediatrics2011;127:e622-9. doi:10.1542/peds.2009-3598 pmid:21321024. Sullivan AE, Hopkins PN, Weng HY, et al. Delivery of monochorionic twins in the absence of complications: analysis of neonatal outcomes and costs. Am J Obstet Gynecol2012;206:257.e1-7. doi:10.1016/j.ajog.2011.12.016 pmid:22284957. Tang M-L, Tang NS. Exact Tests for Comparing Two Paired Proportions with Incomplete Data. Biom J2004;46:72-82doi:10.1002/bimj.200210003. Fong F, Thangaratinam S, Zamora J. Increased stillbirth in uncomplicated monochorionic twin pregnancies: a systematic review and meta-analysis. Obstet Gynecol2013;122:1302. doi:10.1097/AOG.0000000000000026 pmid:24264697. Helmerhorst FM, Perquin DA, Donker D, Keirse MJ. Perinatal outcome of singletons and twins after assisted conception: a systematic review of controlled studies. BMJ2004;328:261. doi:10.1136/bmj.37957.560278.EE pmid:14742347. Lee YM. Delivery of twins. Semin Perinatol2012;36:195-200. doi:10.1053/j.semperi.2012.02.004 pmid:22713501. Kahn B, Lumey LH, Zybert PA, et al. Prospective risk of fetal death in singleton, twin, and triplet gestations: implications for practice. Obstet Gynecol2003;102:685-92.pmid:14550996. Cheung YB, Yip P, Karlberg J. Mortality of twins and singletons by gestational age: a varying-coefficient approach. Am J Epidemiol2000;152:1107-16. doi:10.1093/aje/152.12.1107 pmid:11130615. RCOG RCoOaG. Each Baby Counts. 2016. https://www.rcog.org.uk/eachbabycounts. Laws PJHL. Australia’s mothers and babies 2006.AIHW National Perinatal Statistics Unit, 2008. Elliott JP. High-order multiple gestations. Semin Perinatol2005;29:305-11. doi:10.1053/j.semperi.2005.08.001 pmid:16360489. Chan ASJ, Nguyen A, Sage L. Pregnancy Outcome in South Australia 2007.Pregnancy Outcome Unit, 2008. Bérard A, Le Tiec M, De Vera MA. Study of the costs and morbidities of late-preterm birth. Arch Dis Child Fetal Neonatal Ed2012;97:F329-34. doi:10.1136/fetalneonatal-2011-300969 pmid:22933090. Hillman SC, Morris RK, Kilby MD. Co-twin prognosis after single fetal death: a systematic review and meta-analysis. Obstet Gynecol2011;118:928-40. doi:10.1097/AOG.0b013e31822f129d pmid:21934458.